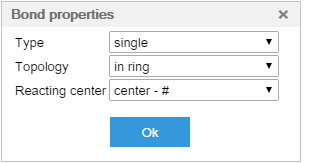 In bond properties dialog you can set the type, the topology and reacting center property of the selected bond(s). Right-click on a bond and choose Bond property from the context menu. In the opening Bond properties dialog set the appropriate values from the lists, then click OK. Which values are available in Marvin JS?